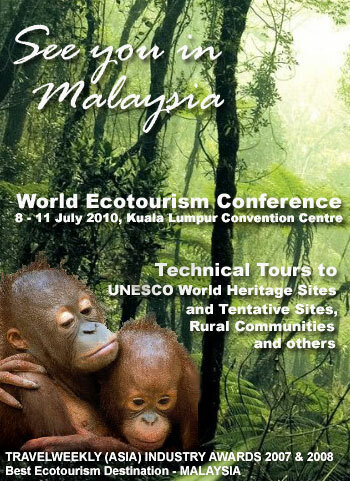 These post tours are prepared and sponsored by WEC2010 partner eco-tour operators for registered delegates of World Ecotourism Conference 2010. All enquiries are to be directed to the respective operators but bookings are made through WEC2010 Secretariat. As you leave the busy hub of Kuala Lumpur and head north towards Perak, the character of the land changes from an urban profile to a scenic, undulating countryside. Here and there, you will glimpse pleasant plots of farmland, palm oil and rubber plantations. The magnificent view is set against a background of green jungle and jagged limestone hills. The Main Range mountains cut across the state of Perak, standing in dramatic juxtaposition to the flat, steaming plains of the western coastline. Each district has its own characteristic beauty and history, and tourist attractions that include old-style Anglo-Malay and Chinese mansions, colonial buildings, ancient limestone caves, temples and cool hill stations such as the Bukit Larut (Maxwell Hill) station. Perak's capital, Ipoh is a slow-moving, quiet town full of quaint old bungalows and is famed for its simple yet excellent hawker food. The hawker fare here has such an excellent reputation that it is not unusual for Malaysians from other towns to drive for up to three hours just for a bowl of delicious noodles! Kota Kinabalu, the capital, lies in a fertile lowland plain where most commercial and administrative activities are concentrated. But the 'real' Sabah can best be found in its contryside. Sipadan island off the south eastern coast of Sabah, has been one of the top five dive sites in the world for years. This is attributed to unique underwater goegraphy that encourages proliferation of wildlife. Leatherback turtles, barracuda and white tipped sharks are a common sight while diving in Sipadan. The name 'Borneo' has long meant magic to travellers, and if you skip Sarawak, you'll miss something special. The state has a superb system of national parks, beautiful beaches and a diverse thriving tribal culture whose hospitality to strangers is unmatched. Situated on the north-western coast of Borneo, the Land of Hornbills beckons the visitor with its rich rainforests, intricate weave of rivers, pepper plantations, and the diverse cultures of its indigenous people. Pahang, the largest state in Peninsular Malaysia, is endowed with a diverse range of attractions. Nearly two-thirds of the state is enveloped in verdant rainforest, making it a magnificent enclave of lush greenery, exotic wildlife and natural wonders. The country's premier national park, Taman Negara, as well as the Endau Rompin State Park, contain an astounding ecological diversity with a vast collection of flora and fauna. The Orang Asli, Malaysia's indigenous people, with their intriguing traditions and way of life, add colour to Pahang's heritage. Pahang's long, scenic coastline is a paradise of swaying palms and sandy beaches washed by the South China Sea. Cherating Beach and Tioman Island are renowned as the region's most popular beach resorts, captivating sun seekers with their exciting beach activities, underwater attractions and relaxed charm. The formidable Main Range of mountains divide the state into east and west, and Gunung Tahan, the highest peak in the peninsula, provides challenging adventures for serious climbers. The state's mountainous terrain has also endowed it with several invigorating hill stations, ideal for fun-filled family holidays. Genting Highlands, dubbed the City of Entertainment, and Bukit Tinggi, a French-themed resort, are excellent getaways situated an hour's drive from Kuala Lumpur. Fraser's Hill and Cameron Highlands are quaint hill stations, which offer fantastic bird watching and nature trails. Developing regional and domestic markets for ecotourism, learning from the leaders in destination positioning, e-marketing and the evaluation of green tourism economies in developing countries, exploring the successful branding of destinations with world heritage status and of commercial companies acquiring green certification; and analyzing how to protect the brand when crisis strikes. Successful recipes for collaborating with other destinations and working with the industry, sharing resources, soliciting public funding plus the way forward for destinations enhancing tourism competitiveness through cooperation as well as building sustainable success through partnerships. Sustainable Ecotourism embraces all segments of the industry with guidelines and criteria that seek to reduce environmental impacts, particularly the use of non-renewable resources, using measurable benchmarks, and to improve tourism’s contribution to sustainable development and environmental conservation. Where are we now and where are we heading? Reduce tourism’s negative impacts and to increase the positive contribution of tourism business and consumption activity to local sustainable development. Solutions to adverse tourism impacts are to be found in the shared interest of local communities, tourism businesses, and tourism consumers to maintain the natural wealth and social heritage of the tourist destination.